September is here and for me, this ninth month always marks a time of potential and promise. Part of me always wants to go back to school in September, especially now because I crave some form of academic challenge. After two years of focus on professional pastry, I am feeling a bit brain dead without any opportunity to learn, analyze, and formulate new ideas in a setting where my peers have a common academic goal. Pastry kitchens are where your sweat and hands are valued more than your brain and although organization and efficiency are necessary to succeed, very often the unfortunate measure of a good pastry cook is how much overtime you will do or how many aches and pains you will endure. Luckily, my creative pursuits at home allow a counter-balance to this academic void. 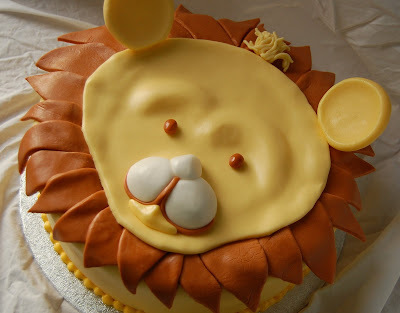 For example, this baby shower cake in the form of a lion's face was a chance to translate a two-dimensional image into three-dimensional edible form. Given a wall paper sample to work from, the lion was chosen as the main subject. Inside, a traditional carrot cake with cream cheese filling was requested. I used some creative license with the mane and snout and was worried that the lion was starting to look like a sunflower at one point; however, he turned out quite well. 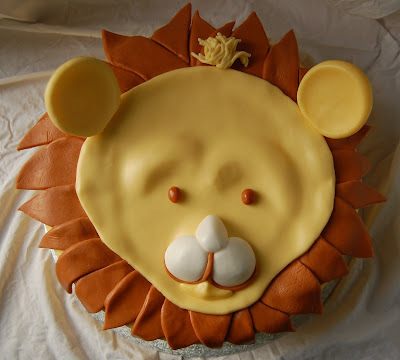 In retrospect, I would have built up the center of the cake so that the lion would have less of a LeFort 3 fracture flat mid-face appearance, but hindsight is 20/15, isn't it? Posted by Charmaine at 11:09 a.m. This is one of the loveliest cakes I've ever seen. Great job! September 2, 2008 at 6:22 a.m.
Hope your fall is one for recharging after the go-go-go nature of a busy summer. September 2, 2008 at 7:32 a.m.
You are so funny with the ophthalmology references!!! I know how you feel now that I have been off work since June! Your creations however are AMAZING!!! September 2, 2008 at 1:19 p.m.
September 2, 2008 at 3:04 p.m. ADORABLE!!! What a cute concept for a cake! September 2, 2008 at 3:39 p.m.
September 2, 2008 at 8:13 p.m.
yes, pastry cooks will cut fruit, make whipped cream and maybe, just maybe, cookie dough... but that should not stop anyone right? we all have to start somewhere and trust me, I did a lot of that too! But then you go home and you make an amazing cake like this and you show the world that you are one to stand out in the sea of pastry cooks. Fantastic! September 3, 2008 at 4:35 a.m. I just discovered your blog through a link on Tastespotting and find your work and photography both appealing and approachable. Seeing your cakes makes me long to attend pastry school. For the record, I completely identify with your craving for an academic challenge each September. If I had all the time and money in the world, I'd enroll at the university (or even culinary school) time and time again. This cake is simply adorable. You did a wonderful job! September 4, 2008 at 5:06 a.m.
September 4, 2008 at 6:52 p.m.